If you're looking for something non-fattening, yet utterly satisfying to fill out your Easter basket this year, here's a suggestion. Try this rich and tantalizing assortment of Russian Orthodox church music. Each of these two dozen miniatures expresses the simple faith of true believers with tremendous power and conviction. While a few selections (such as 'The Angel Cried') portray the inconsolable grief upon the death of the savior, most celebrate the joyous news of the resurrection in exuberant and irresistibly festive tones. 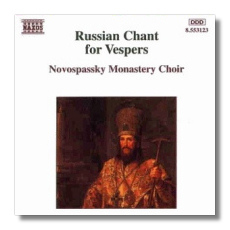 The Novospassky choir produces a virile, smooth, and quite often haunting sound - especially the ink-black basses and the expressive (though anonymous) soloists. It's comforting to know that the great tradition of a cappella Russian choral singing was not lost under the iron-fisted rule of the brutal, atheistic commissars. Just as it is not necessary to be Jewish to appreciate the plaintive folk melodies recorded by violinist Mischa Elman (Vanguard) and others, you need not be among the faithful to enjoy this disc. Indeed, anyone with a passing interest in Russian music will find much of value here. For in these compositions (and other works composed for the Orthodox Church) one encounters the very roots of the Russian classical tradition. You'll hear a bit of Moussorgsky's Boris Godunov here, a hint of a Rachmaninoff Prélude there, and even the spooky incantation from Prokofieff's hell-raising cantata 'Seven, They are Seven' (just listen to the beginning of the final selection on the disc, called 'Many Years'). The program opens with the glorious sonority of Russian church bells, ringing out a rhythm that will be instantly recognizable to anyone familiar with 'Russian Easter' from Rachmaninoff's first two-piano suite. Among the most powerful works in this collection is Kastalsky's 'The Joy of Those Who Mourn,' a poignant lament that is as comforting and reassuring today as it must have been in the troubled times when it was written. Equally powerful is Kastalsky's 'O Lord, I Have Cried Unto Thee' with its stern character, archaic harmonies, and haunting beauty. The ostinato rhythms and similarity of mood (unbridled joy) of the first five vocal selections quickly become tiresome, but there's considerably more variety and contrast among the remaining items on this intriguing program. However, this is definitely a 'no frills' production. There are no texts or translations, making it difficult for non-Russian speakers like myself to fully appreciate the composers' skillful settings of these sacred texts. To make matters worse, the composers themselves are not always clearly identified. Selections are listed by title only on the back of the jewel box. The notes mention some, but not all of the composers' names. For example, we are told that 'Christ Is Risen from the Dead' is by Kastalsky, but there are four different works with that title. Which one did he write? Your guess is as good as mine. Nor is there much biographical information. The notes state that Kastalsky's time was "the end of the nineteenth and the beginning of the twentieth centuries", but that's nearly all we learn about about him. Pavel Chesnokov was "a composer of the same epoch as those mentioned below", but we're never told when those other composers lived. Since most of these men are unknown to non-Russian music lovers, some background would surely add to our appreciation of their sublime music. I naturally assumed that this wonderfully spacious, reverberant recording was made in one of Moscow's great cathedrals, but it turns out that the venue was the Mosfilm Studio. The result is nonetheless breathtaking for its beauty and warmth. If you haven't yet become acquainted with Russian Church music, there's never been a better - or more economical - way to get started.